1926. The Birth of Fianna Fail. 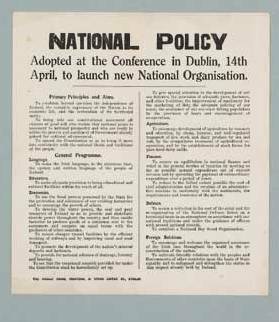 Poster notice to announce launch of Fianna Fail: National Policy to Launch new National Organisation In March 1926 a special conference of Sinn Féin declined to carry de Valera's proposals for flexibility in relation to attending Dáil Éireann. De Valera resigned as President of Sinn Féin and withdrew his supporters. 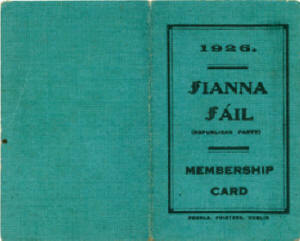 An organising meeting was held on 14 April, the date quoted in this poster (see Langford and O'Neill, page 245), and on 17 April de Valera gave an interview to United Press Agency in which he gave the name of the new party as Fíanna Fáil. 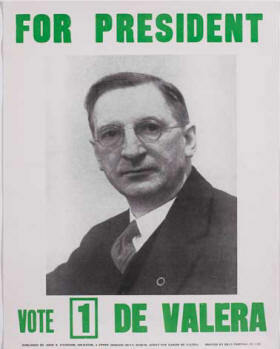 This poster appears to be the earliest public document prepared for the new party, and must have been drafted mainly by de Valera as it is consistent with his UPA interview. The poster is rare and is not mentioned by Cogan or Longford and O'Neill, who mention only a letter to potential supporters. 1959 Poster Vote 1 DE VALERA Original election poster published by John S. O'Connor lithograph including black white photograph 51 by 38cm., 20 by 15in.